Product overview by Vlad Catrinescu – requested by MetaOption, but thoughts are my own. MetaCaseDesk is an advanced Helpdesk, Ticketing Tool and Case management solution for customers running on-premises Microsoft SharePoint 2013 and SharePoint 2010. 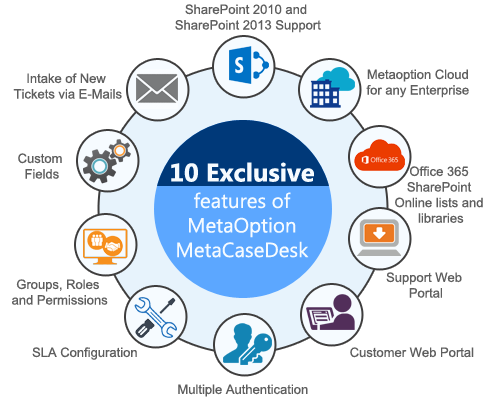 Customers not using SharePoint and SharePoint Office 365 customers have an option to use MetaCaseDesk on MetaOption Cloud. MetaCaseDesk has two major portals. Support User portal allows supports users to login, create, manage and track tickets. 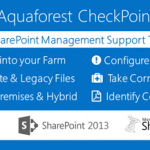 Customer portal allows users to login into a secure SharePoint website and report/track incidents/cases. Supported authentication modes for customer users are Active Directory (AD), Cross Domain Authentication, Custom Login/Password, and Web Services. Thus, System setting allows users to view ticket through a secure link without logging into the system. For this review, MetaOption gave me a demo environment with multiple tickets already submitted. MetaCaseDesk has two portals that we will look at in this review. The first one is the Support User Portal. 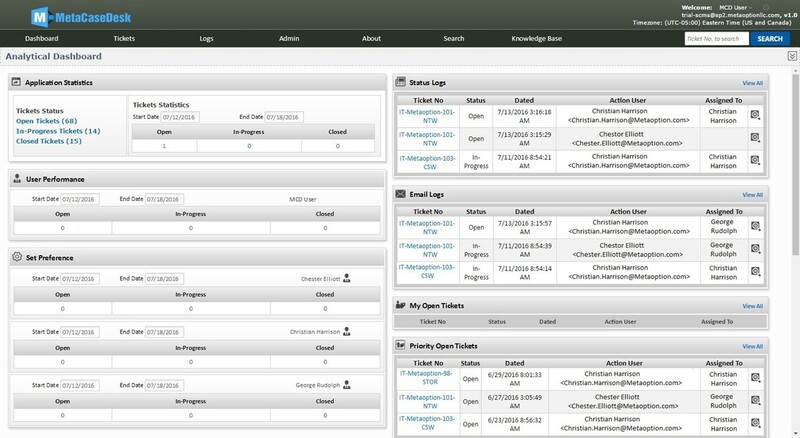 The Support User Portal is where your Helpdesk team will log in and manage tickets. When inside a ticket, we first see all the information about the customer, and the ticket such as ticket number, opened date, due date as well as priority and who this ticket is assigned to. Lower on the ticket page, we can see all the history of the ticket, as well as the email logs. 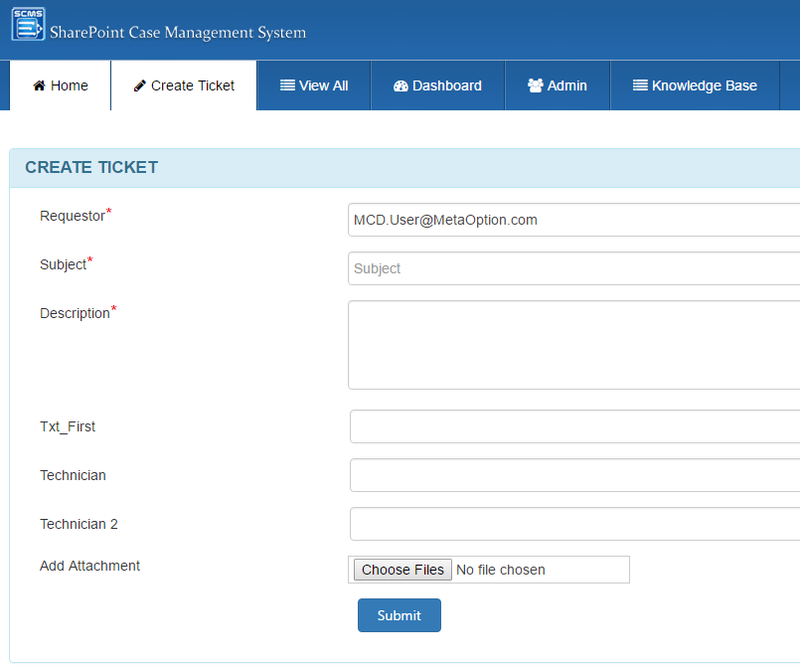 With MetaCaseDesk, you can open support tickets from the two portals, as well as by directly by email. Users will not have to go to the site to reply to a ticket, everything can be done by email which is pretty awesome. Not only you can open tickets by email, you can also reply to them by email, or as a support person, you can reply to them directly from the MetaOption Interface and do other actions such as Close the ticket at the same time. 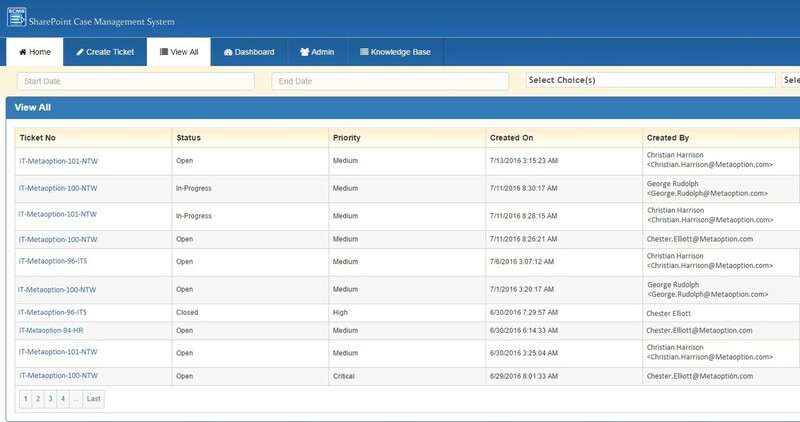 MetaOption also has two different dashboards that Helpdesk managers can use to see the status of the support queue. The first one that we saw in the first screenshot of the review is called the Analytical Dashboard. The second one seen below is the Graphical Dashboard, which is a bit more visual, and allows you to view the health of your system in only a few seconds. 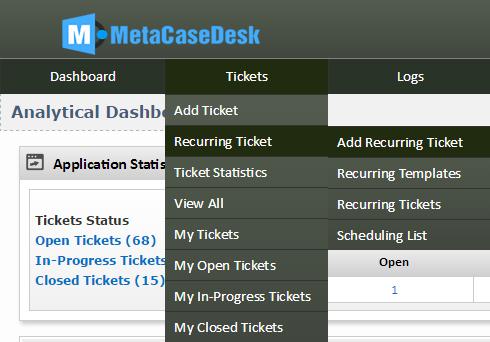 MetaCaseDesk also allows you to create recurring tickets. For example, create a ticket for the SQL DBA every Monday to make sure that all database backups have completed successfully. 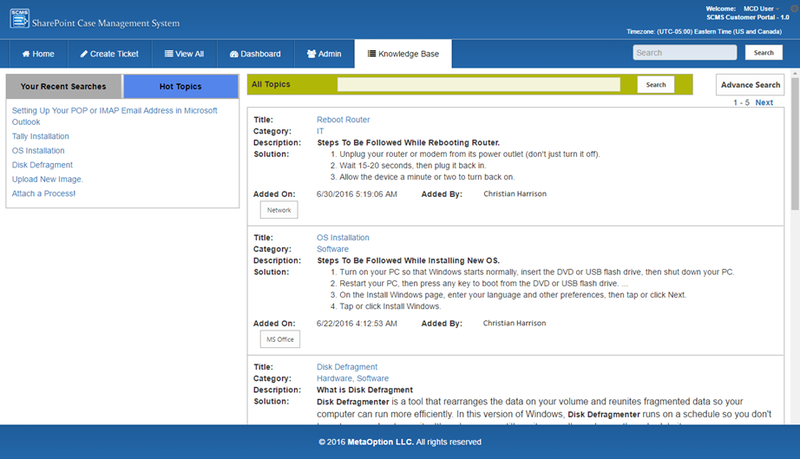 MetaCaseDesk also allows you to create a Knowledge Base. Having a Knowledge Base will allow users to find answers to some of their errors, without even opening a ticket. If users still open support tickets about those issues, support personnel can direct users to articles in the knowledgebase which should answer their questions. Now that we did an overview of the Support User Portal, let’s take a look at the Customer Portal. The Customer Portal is where your customers would login and create tickets. Creating a ticket is easy, you simply have to fill the information in the form and click Submit. When configuring MetaCaseDesk, you also have the option to add Custom Fields if you want to track other types of information. From the Customer Portal, you also have Access to the Knowledge Base, but only the items that have been made visible. When creating a Knowledge Base article, Support Personnel can keep it internal to support, or publish it on the customer portal. Lastly, one of the cool options of MetaCaseDesk is the ability to create multiple business units. A business unit can be everything from different offices inside your organization, or different departments ex: Customer Support, HR, Billing, etc. Business Units can have different permissions, so only the right users have access to the support tickets in that business unit. In order to correctly route item, MetaCaseDesk allows you to create Assignment Rules based on keywords, from what email it’s received or Customers as source. You can assign multiple rules, and decide their priority. An internal workflow system will analyze the ticket, and assign it to the proper Business Unit or user based on the rules you have created. You could direct all the tickets containing “Server” or “Desktop” to the HelpDesk group for example, while all the tickets with the keyword “Invoice” to the Billing group. 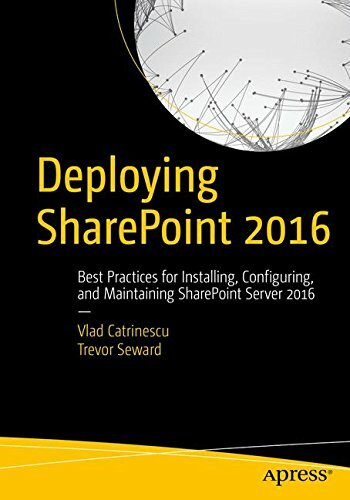 I think this is a great feature for companies who want to manage all their tickets on SharePoint, but want to make sure only the right people see the tickets they are supposed to see. 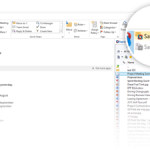 In this blog post, we have looked at MetaCaseDesk, a Helpdesk tool created by MetaOption, which is hosted on top of SharePoint. 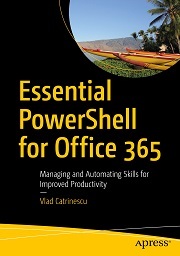 The tool definitely has a lot of features, and is really easy to use. I really liked the fact that you can open and reply to tickets directly via email, as well as the recurring ticket functionality and the knowledge base. I didn’t have any bugs with all the included features, and they all worked really fast. What I wish the tool had is a way to track how much time a support user spends on a certain ticket, in order to be able to bill your customers for support at the end of the month. If needed, I am sure this could be done using a Custom Field, but I would have really liked of it was included Out of the Box! If you are looking for a Helpdesk tool based on SharePoint, make sure to check out MetaCaseDesk by MetaOption by clicking the logo below. 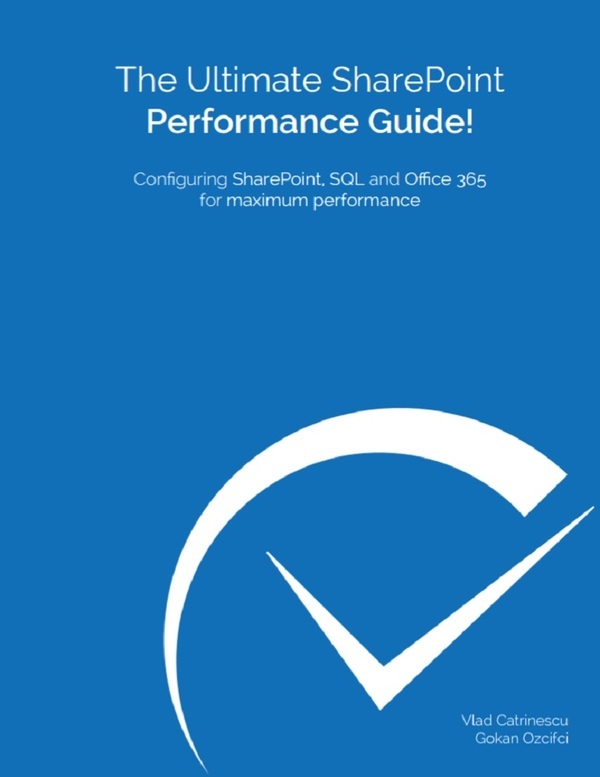 May 26, 2015 Review of CloudShare: cloud-computing platform for developing and testing IT applications, software, and systems.